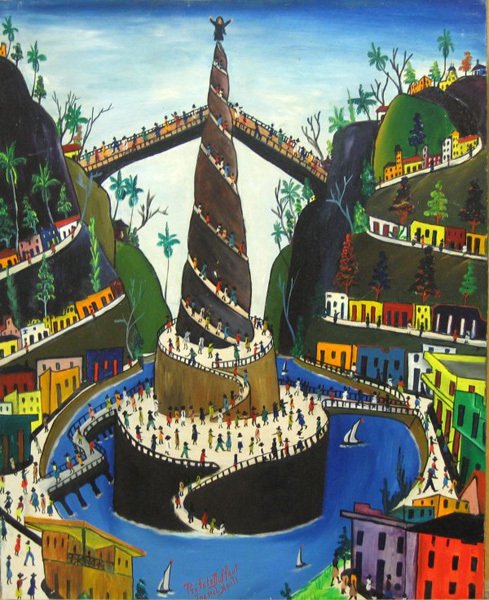 A painting of the earthquake by an unknown Haitian artist. Photo by Thony Belizaire/AFP/Getty Images. Jan. 12 marks the first anniversary of the devastating earthquake in Haiti. Among the millions of Haitians still homeless and rebuilding their lives are artists — painters, musicians, writers. This week, Haitian-American poet and scholar Patrick Sylvain will be writing for Art Beat about his home country and its art, its history and future, and how its artists are surviving in the earthquake’s aftermath. “Here, I want you to have a physical memory, a piece of our destroyed building,” Sylvaince Jean-Paul, a well-known Haitian artist, said as he handed me a 2 1/2 x 5-inch ceramic tile with bright etchings of diving birds and other figures. His gesture was not only generous, but it was also representative of the spirit of a people emotionally, spiritually and viscerally connected to art. Six months after the January 2010 earthquake, not only was I standing on the ground that had violently shook and consumed thousands, but I was holding a piece of a shattered building (pictured at right) transformed into material art, linking me to a palpable catastrophe that was still all around. A remnant. 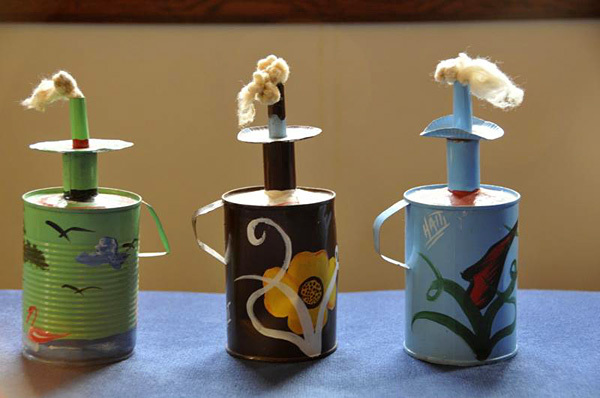 Despite partial destruction, the artists of Jacmel were proceeding through life with vivacious creativity, turning old boots, doors, latches, pots and, of course, canvas into art. The act not only fed their despairing souls, but placed them as important chroniclers of Haiti’s tragic and vibrant history. 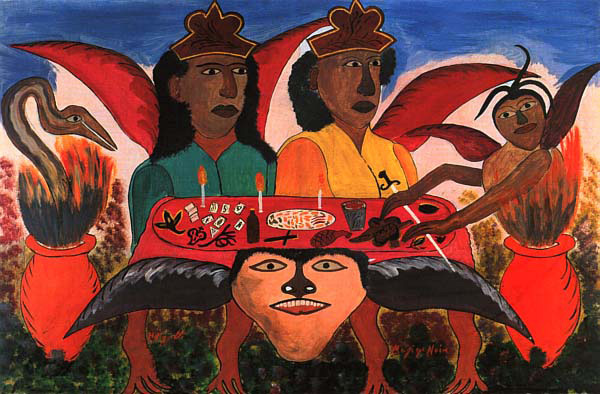 Haitian art is well represented by both classically trained and self-taught artists who have interpreted the dynamics and complexities of the Haitian culture despite hardship. It is as if the arts have their own intrinsic value that refuses to be corrupted by the material conditions of the country. Jacmel is one home of Haiti’s pulsating arts scene, where major painters such as Prefete Duffault have taken back their brushes to chronicle their neighborhoods, their cities and the fractured country whose spine remains broken. 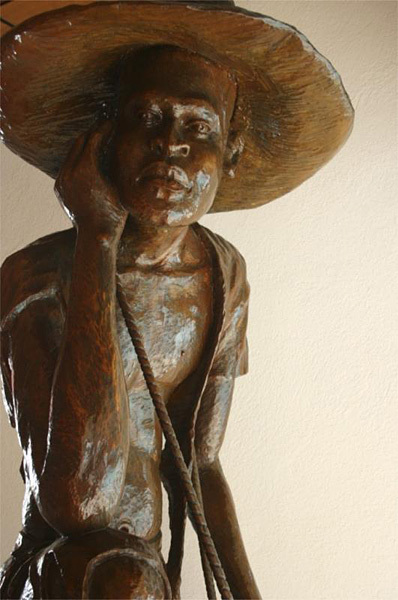 Haiti has always bled masters of the visual arts — from sculpture, both wood and metal, basket weaving, pottery, recycled metals, sequined Vodoun flags, murals, to the canvas. 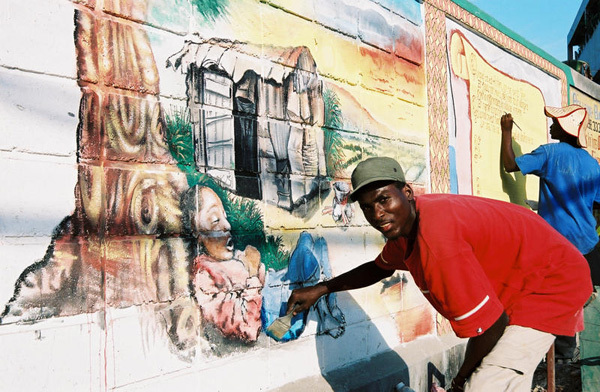 In his 1997 documentary, “Haiti: A Painted History,” Jean-Marie Drot posited on the fact that Haiti, with its high rate of illiteracy, has produced some of the most renowned painters in the Caribbean. They have visually recounted Haiti’s history and masked brutal poverty through colorful explosions of passion, imagination, anger and a desire to translate their environment into interpretive desires (social, sexual, religious, historical, political and exhilarating phantasm). A short list of the most renowned Haitian visual artists includes: the Obin brothers, Philome and Seneque; Hector Hyppolite; Andre Pierre; Edouard Duval-Carrie; Gerard Fombrun; Jean-Claude “Tiga” Garoute; Dieudonne Cedor; Marie-Jose Nandal-Gardere; Rejin Leys; Andree Malebranche; Philippe Dodard; Jean-Rene Jerome; Lyonel Laurenceau; Frantz Zephirin; Bernard Sejourne; the multi-talented Marie-Therese Dupoux (Marithou); and the brilliant Bernard Wah. 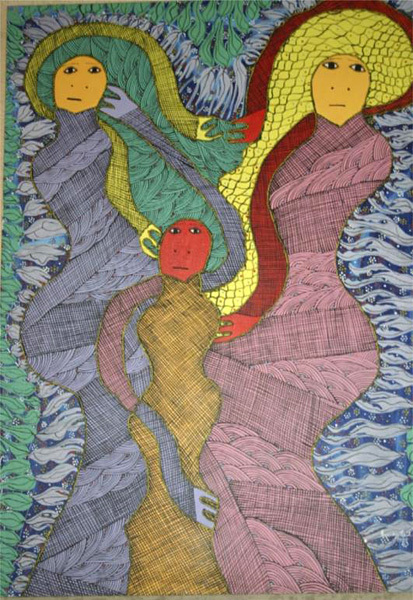 Some of my favorite Haitian paintings, like those of Zephirin, Duffault or Prosper Pierre-Louis (one of the masters of Tiga’s Saint-Soleil movement), have a way of encapsulating and sometimes jolting the senses into a depth of multiplicity and poly-schemes, which forces one to re-enter and re-encounter them in order to feel at one with them and to understand their complex thematic schemes. Perhaps this is due to Haiti’s intrinsic relationship to Vodoun, the amalgamation of West African and New World religious beliefs and practices that has been a source of resistance, reverie and inspiration among the Haitian people. Could it be coincidental that many members of the bourgeoisie as well as the very poor who have taken the brush as their medium of expression found their muse through Vodoun? As a way of celebrating and maintaining the vibrancy of visual art production in Jacmel, the Haitian Artists Assembly of Massachusetts, of which Sylvain is a member, is sponsoring a collaborative traveling art exhibit, “When Our Brushes Shook,” starting Jan. 10 at Boston City Hall, to generate funding for the creation of a modern art center to maintain the importance of art in Jacmel, and help to train and inspire youth in the arts.